People First: Economy with the Truth Carmarthenshire Style - Councillor weirdly reveals less than everyone already knows. Economy with the Truth Carmarthenshire Style - Councillor weirdly reveals less than everyone already knows. Elected representatives of the people usually have or at least endorse ambitions to help people and govern openly and well. However, it doesn't always work out that way, especially in Councils where senior Councillors and/or council civil servants have got into the habit of tightly running the show. 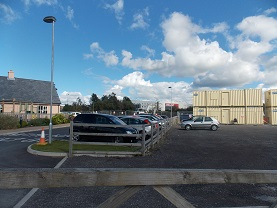 The question was asked as to why part of the lease for Park y Scarlets [one of their car parks] was sold for £850,000 and the council, the owner of the plot, only got £200,000 of it. No mystery says Cllr Jenkins, the district valuer said that an equal amount of the net proceeds of the sale would go to the 2 interested parties, the Scarlets Rugby Club [tennants] and Carmarthenshire County Council, they got £200,000 each. No mystery at all. apparently. Here's where the economy of truth comes in. The district valuer had said that after the usual disbursements (legal fees, agents fees etc) a 50/50 split was fair. Here we have a lease sale where the disbursements apparently add up to more than the after sales profit. £450,000 is a lot for costs, even allowing for the huge legal and agency fees local Authorities often pay. The previous Labour Exec member for finance, the man who made the decision Cllr Jeff Edmunds, was kind enough to meet with me after the sale and actually explain the low figure. The £450k cut contained not only the usual fees and costs of a sale but also £280,000 to pay off HDD, the then owners of the Llanelli Eastgate buildings. The sum was to pay for debts run up by the Scarlets in a shop unit rented by them there. Jeff had been persuaded to do this, he said, by Chief Executive Mark James, allegedly in the interests of encouraging public footfall at the Eastgate,by keeping the Scarlets' shop open. As this money was now labelled a disbursement, it did not have to be divided as the district valuer suggested. This was unusual, in my opinion immoral, but apparently not out and out illegal. Since then the Scarlets' shop has closed, Marstons have built a pub and work has started on the land earmarked for their hotel at the same site. The big mystery is why Cllr David Jenkins decided to mislead the public by a statement which was, at best, a half truth? His predecessor has had the guts to tell the truth about the "missing" money, the sale is on the Land Registry, the £200,000 is in our published accounts ,and information about the sale has been published in the press, Why omit the information that CCC, apparently legally, gave £280,000 to the Scarlets to clear a private debt and to keep their shop open in Llanelli? Its very generous for Cllr Jenkins to spare the blushes of his predecessor and Labour political opponent Jeff Edmunds or is he protecting the chief executive, who seems to have been instrumental in the whole deal? Either way, not open, not transparent and definitely no accountability. Very interesting! I'm still trying to get my head around the idea of building a pub in the middle of a roundabout with no easy / safe pedestrian access. is the idea that you do your shopping in Trostre then jump in your car, drive the couple of hundred yards to the pub, have a couple of pints then tackle what is now acknowledged one of the most dangerous roundabouts in Wales? There is something very wrong with this. There is something very wrong with an out of town shopping centre sucking the life out of an old town but I don't expect anybody in power thought of that did they?